Camping Bella Sardinia is located in Torre del Pozzo with straight access to the golden beaches and the crystal clear water. The campsite is surrounded by a magnificient 33 hectares pinewood forest. 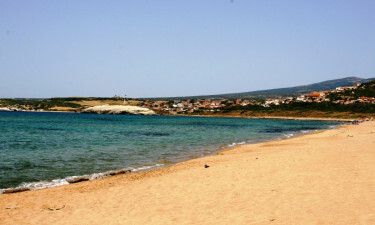 Camping Bella Sardinia creates the framework for a fantastic vacation in Italy. The campsite offers the breathtaken golden beaches, but also a nice poolarea with a waterslide. In accomodation the campsite has plenty of different activities to keep the entire family entertaint during their stay at Bella Sardinia. Why should you choose Bella Sardinia as your next destination? We have listed four excellent reasons, below. 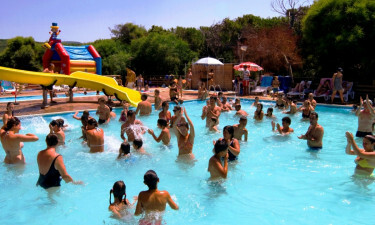 At the campsite you have the possibility to try out some different kinds of activities. You could challenge each other in a game of tennis or minigolf. You could also go horseback riding to see the nature of Sardinia. For the children there is a miniklub and no less than five playgrounds at the campsite. For the entire family you will find evening entertainment of different variations. The restaurant at the campsite is located in the pine forest and will offer dishes from the traditional Sardinian cuisine and of course delicious pizzas. At Camping Bella Sardinia you will also find a newsstand and a minimarket, where you can get the necessary things on your vacation.